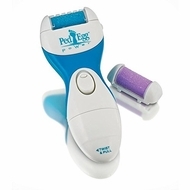 Say goodbye to rough, dry, callused feet with the new, battery-powered Ped Egg Power. Precision engineered, it features the new Nano Abrasion Roller that spins 2,500 times per minute to buff away calluses and dead skin so your feet will be smooth and beautiful. Bonus smoothing head included. Requires 2 "AA" batteries (sold separately). Approximately 6" long..